Product prices and availability are accurate as of 2019-04-02 08:40:51 EDT and are subject to change. Any price and availability information displayed on http://www.amazon.com/ at the time of purchase will apply to the purchase of this product. Ecofam biodegradable toothbrushes utilize Stay Clean technology to eliminate 99% of bristle bacteria. 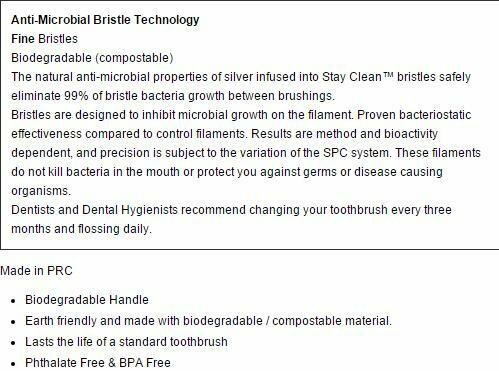 Using silver, which has natural antimicrobial properties, it safely sanitizes bristles between brushings. All Ecofam toothbrushes are eco-friendly with handles that are biodegradable. BPA and phthalate free. Same technology as used in hospitals. Fine bristles. Color: red/white.